If you’ve ever leafed through old notebooks and noticed a preponderance of one particular doodle—mouths, perhaps, or shoes—and been startled that you have unwittingly documented an obsession, you’ll understand how I felt when I realized how many of my poem elfings have been in bathrooms. I posted Edna St. Vincent Millay in a coffee shop lavatory, Seamus Heaney in a hotel lobby ladies’ lounge, and poor Billy Collins has twice been positioned in the loo—once in my mother’s bathroom and later in swankier surroundings. 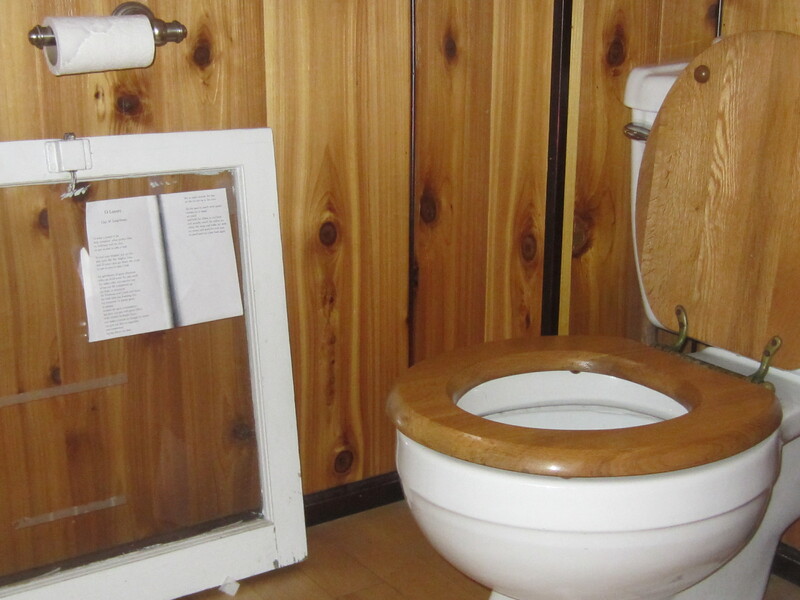 Bathroom Elf has had her moment and it’s time for her to retire, but first a finale performance: a poem about urination taped next to a restaurant toilet. Not exactly clever, but satisfying nonetheless. I could defend my fondness for bathroom elfing by saying that bathrooms are one of the last great distraction-free reading spaces (and twice I’ve posted pictures of toilets for just that purpose), but those close to me would point out that my sense of humor has ever been—er—juvenile, to be discreet. Scatological, if you want to be accurate. the sound of his stallion’s stream seemed so potent, so replete with authority, that it increased her terror of the devastation to come. That memory often returned to her as the years weakened the stream, for she never could resign herself to his wetting the rim of the toilet bowl each time he used it. as a young man his stream was so defined, and so direct that when he was at school he won contests for marksmanship in filling bottles, but with the ravages of age it was not only decreasing, it was also becoming oblique and scattered, and had at last turned into a fantastic fountain, impossible to control despite his many efforts to direct it. Read and weep, young men. And you, young women: some day, when one of you has a room of her own, not only will you not have to put the seat down, you will be free to write a similar passage on the majesty of female urination. There’s a voice waiting to be heard on this important subject, a voice crying out in the wilderness, Does anyone have toilet paper? Male urination really is a kind of accomplishment, an arc of transcendence. A woman merely waters the ground she stands on. Male urination is a form of commentary. It can be friendly when shared but is often aggressive, as in the defacement of public monuments by Sixties rock stars…..Women, like female dogs, are earthbound squatters. There is no projection beyond the boundaries of the self. True, having the ability to deface public monuments or “put out fires or cigarettes” might be fun sometimes (and now with the availability of “Whiz Freedom,” a pleasure women can enjoy as well), but let me defend the “luxury” of female urinary relief. Follow any woman into a rest stop off the Pennsylvania Turnpike and you’ll hear the same “terrible hydraulic force” Longchamps seems to think is exclusive territory of men. As for urination being “much more grand” for men, a certain close relative of mine can wax rhapsodic about the delight she experiences when she eliminates outdoors on her daily run through the woods. This is the section of my post where I usually provide a short biography of the poet. Who is Guy Longchamps and how does “O Luxury” fit into his oeuvre? But I can’t do this because Guy Longchamps does not exist. 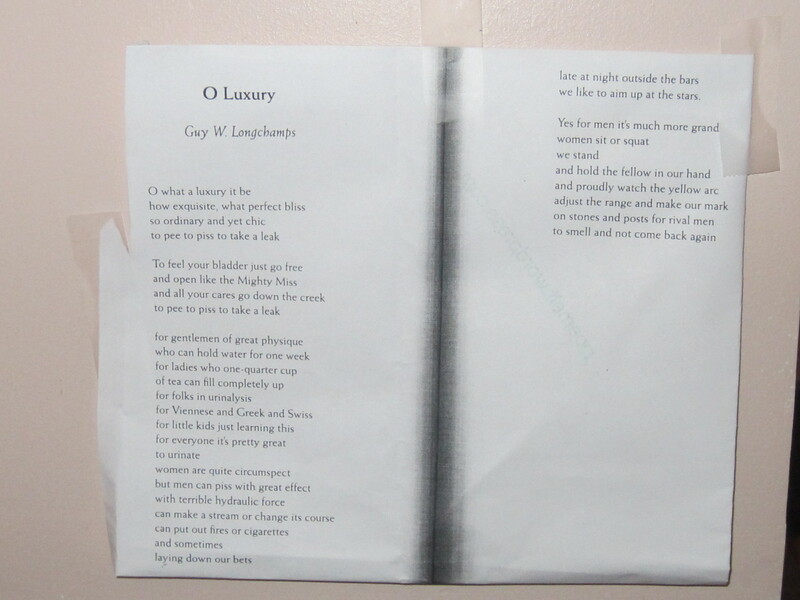 Originally I found “O Luxury” in an anthology edited by humorist Garrison Keillor called Good Poems. Unable to find Longchamps outside of this little ditty and one other he wrote called “Mrs. Sullivan,” I did a little online sleuthing. First I found a comment on another blog that pointed out that the biographical sketch of Longchamps in the back of Keillor’s anthology notes that he is the “manager of Brock’s Soda Fountain in Anoka and a driver on the Anoka-Minneapolis bus line.” Keillor just happens to be from Anoka, Minnesota. On the same blog, someone else traced the poem to Keillor himself and here you can see the poem attributed to Keillor. I should have guessed. Can’t you just hear Keillor’s dignified baritone amping up the silliness of this poem? Can’t you imagine his elfish pleasure at including a poem about pee in an anthology of “Good” poems, in the section called “Yellow,” side by side with the works of Emily Dickinson and May Sarton? Best to sit so you don’t miss.